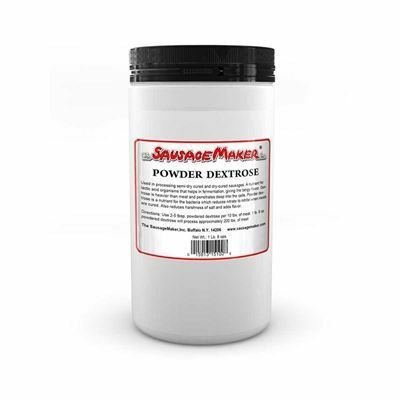 You�re viewing our Sausage Maker powdered dextrose, 1 lb. 8 oz. TSM's powdered dextrose is used for processing dry-cured and semi-dry cured sausages. Dextrose is a sweetener that is 70% as sweet compared to regular sugar, it is a nutrient for lactic acid organisms that is used in the fermentation process. Dextrose is heavier and permeates the cells of meat, giving meat a tangy flavor. TSM suggests using 2-5 tbps. powdered dextrose for every 10 lbs. of meat. This 1 lb. 8 oz. package of powdered dextrose will cure approximately 200 lbs. of meat. We can answer any questions you may have about our products. 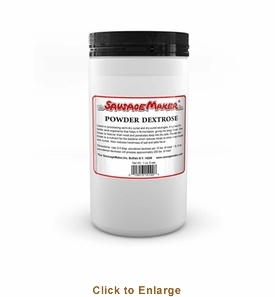 Scroll down to view our Sausage Maker powdered dextrose, 1 lb. 8 oz.